Did A Video Game Guy Tick Off World's 2nd Most Famous Athlete? I don't know David Martinous. And I'm not sure what a "video game technician is." But the New York Times says that a man with that job was challenged to a fight by one of the planet's top sporstmen. 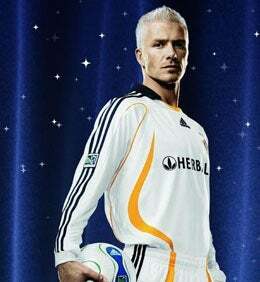 David Beckham, British soccer superstar and recent player for the the U.S.' Major League Soccer has had a rocky two-year tenure with the Los Angeles Galaxy. You don't need to know much about him or soccer to understand why a player who might fall behind only Tiger Woods in global athletic popularity is getting booed by fans. His deal with the L.A. team was reported to be worth $250 million in salary and endorsement. Yet his team has failed to make the play-offs, he has criticized the quality of U.S. soccer, and spent the early part of the current season playing for an Italian team as part of a player loan deal. The New York Times said that Beckham has been given grief before, but.. bring on the video game guy! None of it seemed to fluster him. At least not the way a 28-year-old video-game technician did Sunday night when he questioned Beckham's loyalties during an exhibition between the Los Angeles Galaxy and A.C. Milan, his current and former - or is it future? - clubs. On his way off the field at halftime, Beckham charged toward a small pocket of Galaxy fans who, feeling jilted over his desire to move to Milan, had taunted him with chants and signs, and booed his every touch of the ball. Beckham pointed a finger, shouted several epithets and attempted to climb over a signboard while challenging a Galaxy fan, David Martinous, to come down on the field. To the tune of Pink Floyd's "Another Brick in the Wall," instead of singing "We don't need no education," the Riot Squad roars, "We don't need no David Beckham." And to the tune of "Glory, Glory Man United," not coincidentally a refrain sung by backers of one of Beckham's former teams, Manchester United, the Riot Squad belts out, "Who the [expletive] is David Beckham?" Not what I was expecting to find when I did my morning search for the phrase "video games" in the news.